SPECRM-76: Add VERSIONED_PARTY class definition to demographics specs. 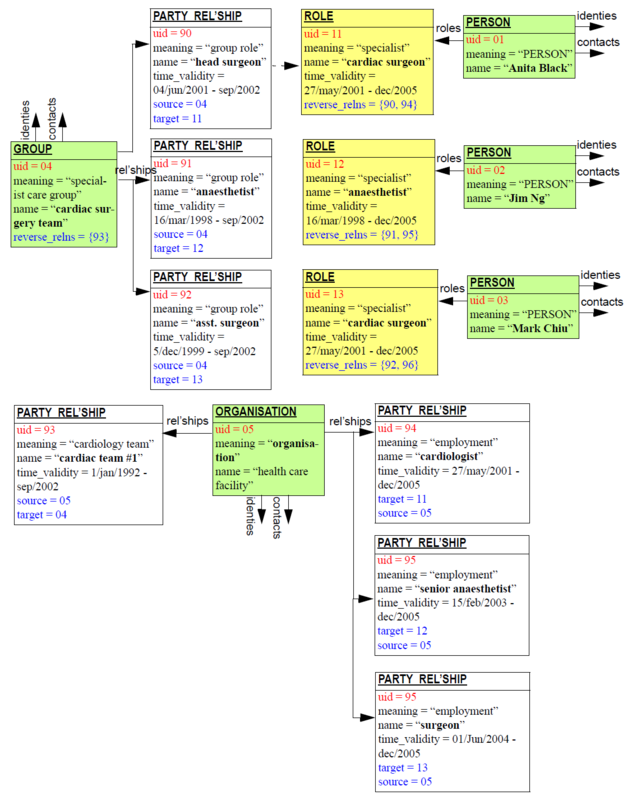 SPECRM-75: Fix description of PARTY.relationships (See SPECPR-104). SPECRM-82: Remove redefinition of PARTY.uid in UML; make ACTOR.languages and roles 0 to many (fixes SPECPR-282, SPECPR-283). SPECRM-46: Fix RM Release 1.0.3 typos and minor documentary errors: correct type of PARTY.type to DV_TEXT. (SPECPR-176). Thomas Beale, Ars Semantica (UK); openEHR Foundation Management Board. This specification is in the Stable state. The development version of this document can be found at https://specifications.openehr.org/releases/RM/latest/demographic.html. Another criterion is that instances of the classes in the model must be serialisable into an EHR Extract in an unambgiuous way. This requires that each PARTY be a self-contained hierarchy of data, in the same way as distinct COMPOSITIONs in the EHR model are distinct hierarchies in an Extract. In order to ensure this condition, PARTY_RELATIONSHIPs must be implemented correctly, so as to prevent endless traversal of all PARTY objects through their relationships, when serialising. See Section 2.1.4 below for details. The model is designed to be used with archetypes, hence the generic nature of all entities. 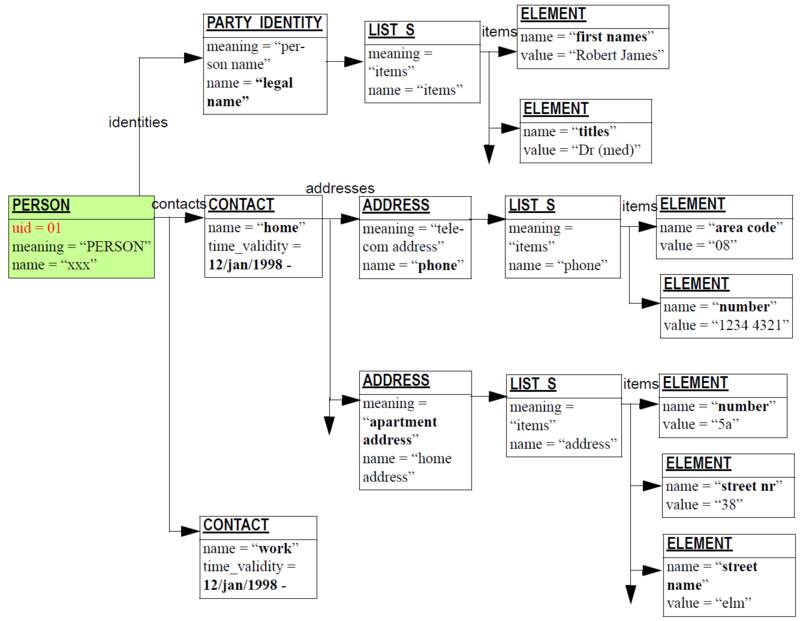 Every class containing an attribute of the form details:STRUCTURE is a completely archetypable structure. 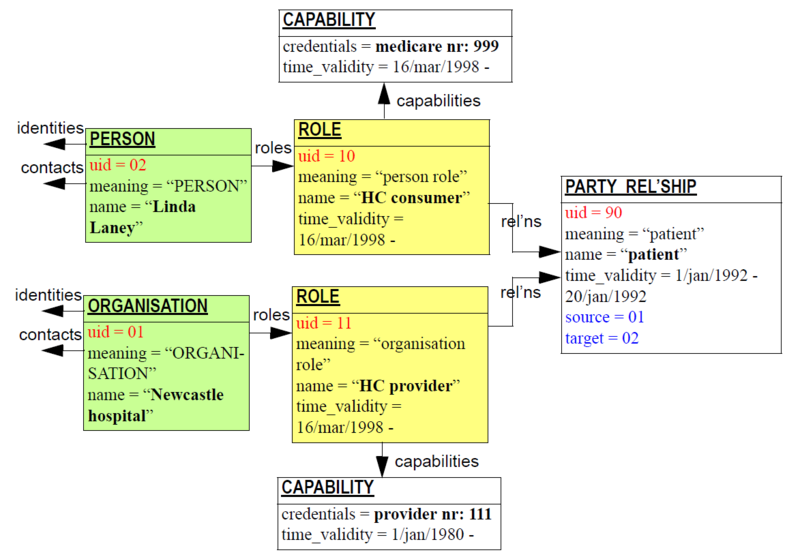 As a result, archetypes can be defined for concepts such as particular kinds of PERSON, ORGANISATION; for actual ROLEs such as "health care practitioner", and for party identities and addresses. The class PARTY and its descendants ACTOR and ROLE are all potentially versioned in a demographic system. A Version of a PARTY includes all the compositional parts, such as identities, contacts, Party relationships of which it is the source. Every Party is stored in its own Version container. References to relationships in which this Party takes part as target. Relationships in which this Party takes part as source. Type of party, such as PERSON, ORGANISATION, etc. Role name, e.g. general practitioner , nurse , private citizen . Taken from inherited name attribute. Static type formed by binding generic parameter of VERSIONED_OBJECT<T> to PARTY. The value of the identity. This will often taken the form of a parseable string or a small structure of strings. Purpose of identity, e.g. legal , stagename, nickname, tribal name, trading name. Taken from value of inherited name attribute. A set of address alternatives for this contact purpose and time validity combination. Purpose for which this contact is used, e.g. mail, daytime phone, etc. Taken from value of inherited name attribute. Type of address, e.g. electronic, locality. Taken from value of inherited name attribute.